Teaching Resources workshops are presented by Pat Calfee, an educational consultant with 25 years experience as a teacher, curriculum coordinator, and staff developer. 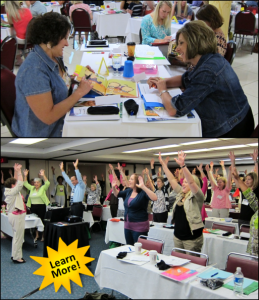 Pat’s workshops are jam-packed with hands-on learning and active engagement strategies, and they’re guaranteed to boost achievement, too. Email Pat to find out how to bring one or the sessions below to your school or district. Need something a little different? 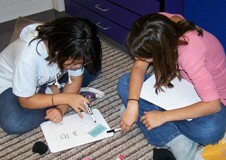 Pat also teaches sessions on Power Reading Workshop, Guided Math, Math Stations, and more! She can customize any of these workshops to meet your school’s needs, or she can work with you to develop a custom workshop on another topic. If you’ve been thinking of starting reader’s workshop but you weren’t sure how to get started, you’ll love this full-day training! 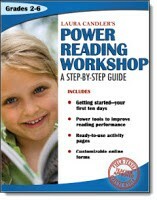 Each participant will receive a copy of Power Reading Workshop: A Step-by-Step Guide along with a packet of supplementary handouts. During this session, you’ll explore how and why reading workshop is one of the most effective methods for improving reading skills and promoting a love of reading. Reading Power Tools – Discover how to use reading “Power Tools” to differentiate instruction for all levels. You’ll explore how and when to use individual conferences and guided reading groups. You’ll also learn a variety of reading response methods, organizational and management strategies, and how to encourage kids to set appropriate reading goals for themselves. Attend this session and discover a toolkit of engaging math strategies that will ensure success for all of your students! Explore cooperative problem solving, math vocabulary strategies, interactive teaching methods, technology tools like Plickers, and more! Educators who attend this session will discover how to use formative assessment to make teaching more interactive. Participants will experience the excitement of cooperative learning strategies and will learn how to incorporate these methods on daily basis. Using fun, hands-on activities, Laura will share practical, easy-to-use strategies to target math standards for grades 2 through 5, enabling ALL students to excel! If you are ready to take your math instruction to the next level, Math Toolkit: Engaging Strategies for Success is exactly what you need! You’ll transform your classroom into an exciting community of mathematics learners, differentiating instruction to meet their needs. This engaging professional development session is full of easy-to-implement strategies that will give teachers a toolkit full of activities to build comprehension and vocabulary skills in their classrooms. All of the strategies are easily incorporated into any existing reading program. Participants will enjoy the many engaging individual, paired and group activities that they can immediately implement in their classrooms to boost student achievement. Activities like Spelling Cheerleading and Text 2 Brain question sorting will keep your students engaged as they develop vocabulary and comprehension skills. 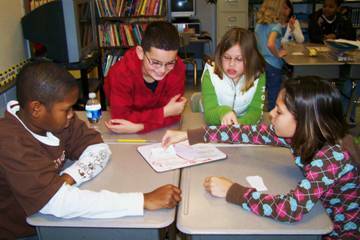 Vocabulary Building Activities – Participate in activities that will build academic vocabulary in a fun, engaging way. Text 2 Brain Questioning – Learn the Text 2 Brain Questioning strategy, a simple yet powerful method to help students become more proficient test-takers. Speaking and Listening Skills – Discover how to teach kids to become effective participants in literacy discussions. Participants receive a large notebook packed with handouts. After attending Literacy Toolkit: Engaging Strategies for Success, you’ll be energized and ready to implement effective literacy strategies from the first week of school next fall!